The Tualatin High School girls swim team battled hard, but came up just short, during last Thursday's Three Rivers League dual meet with West Linn. 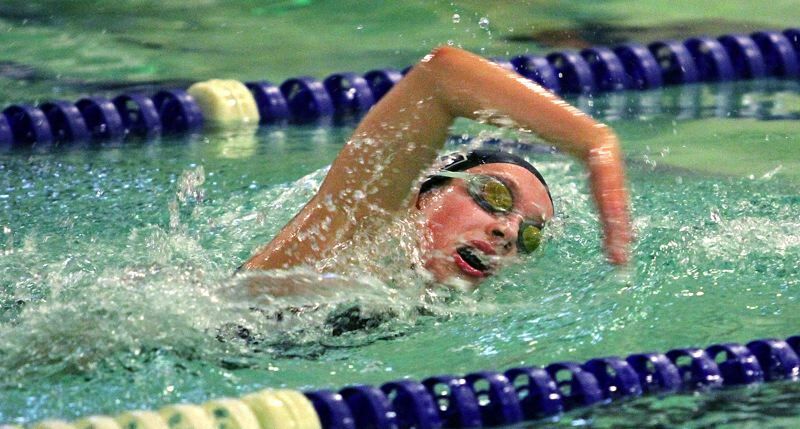 The Timberwolves were edged 96-74 by the Lions in the meet held at the Tualatin Swim Center. With the setback, the Tualatin girls moved to 1-4-1 in league meets. Junior Abbi Karsseboom turned in some strong performances for the Wolves at the meet. Karsseboom won the 500-yard freestyle race in a time of 5 minutes, 11.09 seconds, giving her the win by .11 seconds over West Linn standout Katelyn Laderoute. Karsseboom also triumphed in the 100 breaststroke with a mark of 1:12.31. Karsseboom also teamed with junior Britney Muralt, sophomore Izzy Ehmig and junior Taylor Cockrell to win the 200 freestyle relay with a time of 1:47.13. The Tualatin boys fell 115-54 to West Linn at last week's meet. The loss gives the Wolves a league record of 3-2. Senior Connor Florey had the only first-place finish for the Tualatin boys. Florey triumphed in the 200 individual medley with a time of 2:00.65. Florey also took second place in the 100 breaststroke with a mark of 1:00.60. The Tualatin teams will be back in action on Thursday, when they face rival Tigard in a Three Rivers League dual meet finale set to start at 4 p.m. at the Tigard Swim Center.